Legogirl's Cabin of Adventure........: Sewing in the cabin. 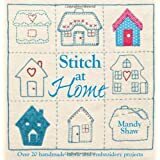 Today I popped to the library to pick up the book I ordered, Stitch at Home by Mandy Shaw. This is her second book, her first was Stitch with Love. Both books are good but I have decided to do a project or two from this book. 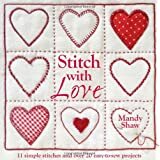 The first project I want to try is; Sampler Picture, this sampler is all embroidery, but to start with I must practise the stitches required. I remember doing some embroidery at school many moons ago, so to complete this project I must do a quick refresher course. Some of the stitch I can do, but it does not hurt to practise. So tomorrow I will start at the beginning with Back Stitch. Also I shall show you the picture I want to sew for the cabin.